It’s been a while since the last ecology quiz. This month’s puzzle should be a lot simpler than the last one. 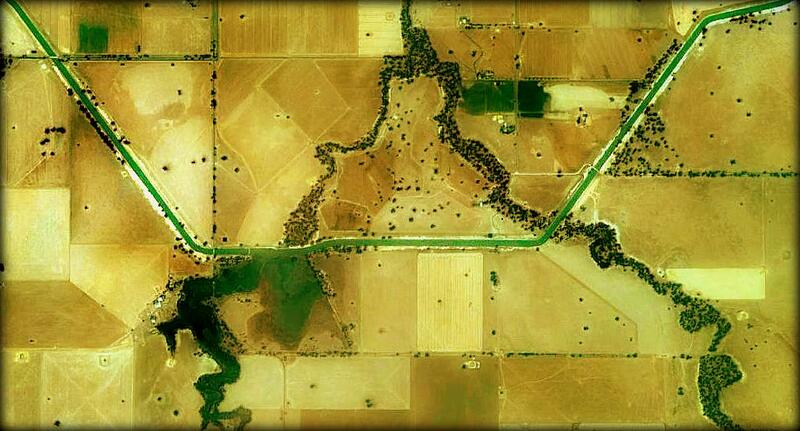 A century ago, an irrigation channel, 100s of kilometers long, was built. The channel crossed many creek-lines, altering the natural flow patterns. In the photo above, two creeks run to the north (top). The creek on the left now banks up south of the channel, and a weir wall regulates flows to the north. The weir reduces flows along the creek and affects a string of intermittent wetlands further downstream. 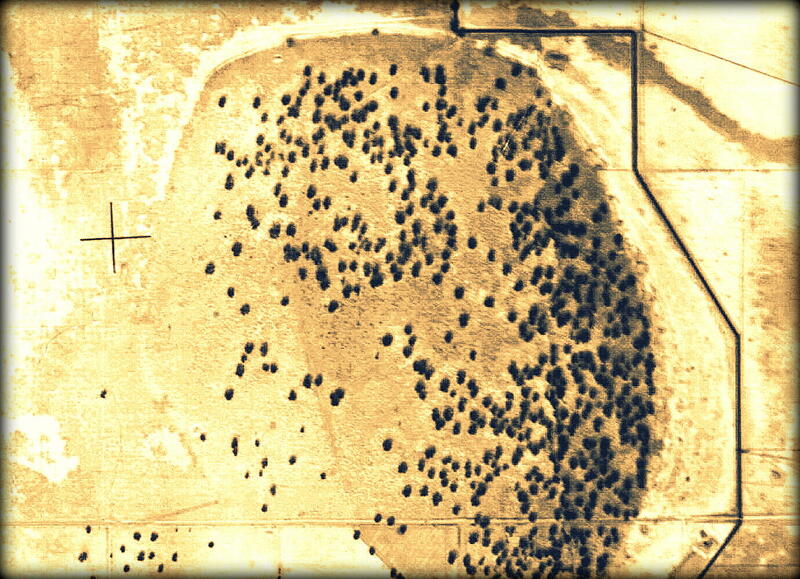 In 1945, when the first air photo was taken, one of these wetlands was bone dry. Large trees were scattered across it, as shown below. Their numbers may have been reduced by earlier clearing, especially in the south-west. The black line east of the wetland is another channel. In 2006, the wetland was again dry, but was very different to the 1940s. A big dam had been built to the north, the western half was cropped, but the eastern side remained uncleared. In fact, over the 60 year period, plant cover increased greatly in the east, as can be seen in the two photos below. This month’s quiz is a simple one. Can you guess the name of the species that increased? And can you explain why it increased? Rather than give a prize to the first correct answer (as I did last time), we’ll see which species is most popular. I’ve suggested ten options in the poll below. Please select an option then click on the Vote button. You can then see which species was most popular by clicking the ‘View Results’ link below the poll. Please also post a comment to explain why the changes may have occurred or to ask questions. You can view earlier blogs about some of these species by searching for their common names in the search pane to the right. In the next blog, I’ll provide the answers and discuss the ecology of the area. Previous How do you grow a woodland tree? The Cassinia option is very tempting because it is such an extensive colonisation event, and the vegetation looks a bit shrubby, but is that too obvious? I think the extent and density of the recruitment is too high for any of the Euc’s (except maybe RRG – but I still doubt it at this site) or the wattle or peppercorn. The vegetation in the photo does not look like either Phragmites or Lignum to me and I think the size of the individuals is too large to be the ground cherry. This leaves the rushes and sedges. It is likely that this wetland although dry is still getting significantly more water than the surrounding area, due to the landscape depression, which may be sufficient to support a range of rushes and sedges. This is supported by the water in the dam, unless that is fed by the channel. Hmm…I’ll vote for this with fingers crossed. LOL Anthony. Scientific representation + Photoshop = Abstract artistic imagery! The patterns are real but the colors have been intensified, partly for aesthetics but party because the manipulations make some of the patterns easier to see. It can be hard to see many patterns on some of the old B&W air photos in particular. I could be wrong but I wouldn’t have thought wetland species like Silver wattle and Phragmites would occur in such density due to the changes in river flow coupled with severe drought especially in the 2000’s. Also if the area was in a depression that accumulated sufficient water to maintain wetland species in such densities that farmer on the west must have awful trouble getting bogged while cropping ;). 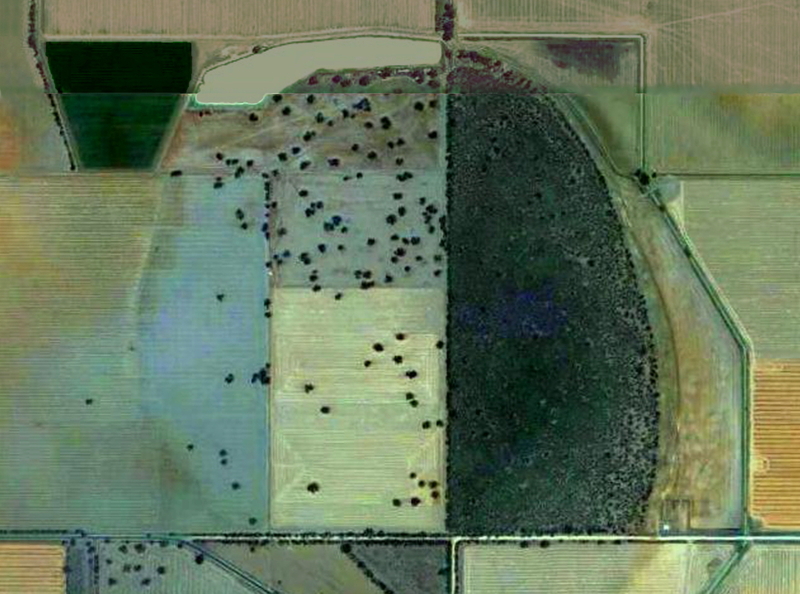 Looks like there is a lot less trees in the 2006 photo relative to the 1945 photo suggesting some disturbance? Given the prevalence of cassinia arcuata in abandoned cropland, I just can’t go past it. I’m just so happy to read these carefully reasoned arguments. It suggests to me that there are some intelligent, educated people in our overfed, overindulged society that value the natural world more than today’s price of gold or Rio Tinto shares. The world needs you, like we need the world! I’m going for Tangled Lignum as it has the ability to persist so well in intermittent flooding situations. You said in a reply to an early comment that the area still does get flooded at times. With its reputed 3m deep root system it is tolerant to drought/flooding regimes and also salinity I understand which might be an issue given the adjacent cropping land. When resurgent it forms dense thickets so the photo in 2006 could be a snap shot following a flooding event. I meant to also add that I don’t think it could be Cassinia arcuata because its short lived seedbank and I think intolerance to flooding would make it harder to persist in intermittent flooding/drought situations. I also chose Cassinia on the basis that, even though the wetland still gets some water, I suspect it would be very shortlived and evaporate quickly. My second choice would have been sedges and rushes, particularly species that tolerate/favour saline environments. The first photo shows that land use in the area is almost entirely agricultural, that is, crops of shallow-rooted species. Even though the east side of the wetland hasn’t been touched, reduced streamflows would have lowered the water table generally and caused salinity to rise to the surface – a common problem in the wheatbelts of SW WA and Sth Aust. Keep the quizzes coming Ian. They’re great. Awww your blog is always great and interesting! It’s distracting me from doing my assignment on mangroves…but I had to drop a line and say that you always entertain me! Hi Ian, i chose black box yay – as i suspect the country to be clay, the wetland initially would have been surrounded by blackbox so the seed base would be there- and the tree can survive on irregular flooding and long periods of drying with vast regeneration activities in good years (regeneration here all seems to be same age). i dont think it is red gum ,despite its capabilities of adapting to different flooding regimes, because regeneration would be of much more advanced and not as consistant . the initial aerial photo also indicated the tree canopy seemed healthy despite the long period of dryness- which i think points to the long suffering black box rather then red gum 🙂 and to top it off i think black box country is used more readily in conjunction with cropping and irrigation .